You can only register for classes if you are logged in. If you do not have an account, click here to create one or view our guide to creating an account. On the main menu, click “Register”. 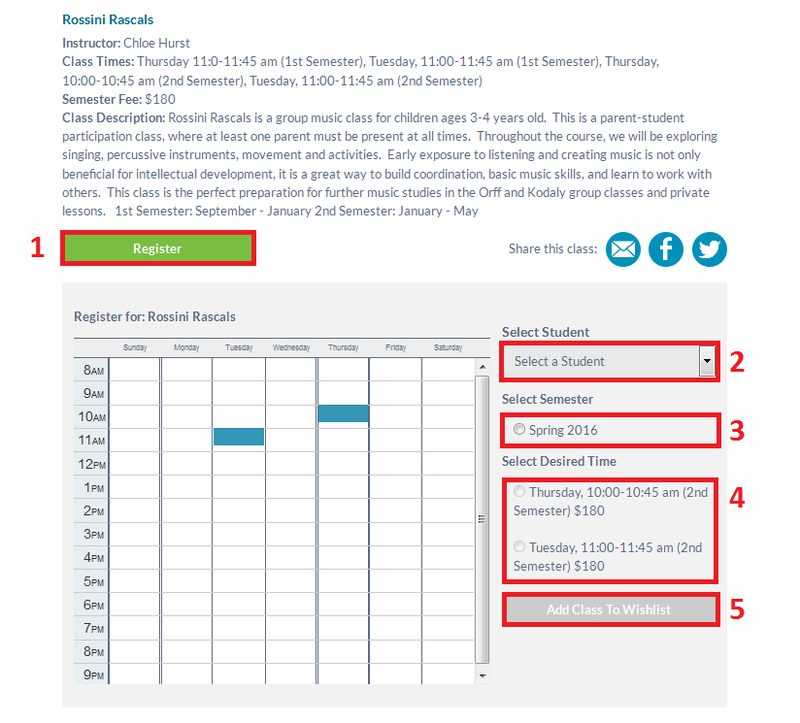 This will be your main tool for registering for lessons or classes. Repeat the above steps as needed if you would like to register for additional lessons and/or classes. 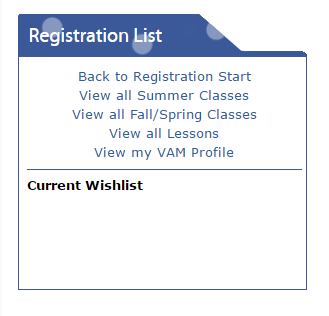 When you add classes to your wishlist, they will not yet begin the registration process. Once you have added everything you would like, you can see your wishlist on the left-hand sidebar to make sure everything is correct. Once you are ready to submit your registration to the office for processing, click “Send to Registrar”. Once you click the “Register Now” button, your request will be forwarded to VAM’s Registrar who will need to approve your course selection(s). You will know that they are approved once you receive an invoice by email. NOTE: During peak periods of registration, requests may take one or two business days to process. If you would like to pay from the comfort of your home, you may use the PayPal option. TIP: PayPal charges a 3% service fee for online transactions. This fee is not applied to payments received at the front office (below). You may also choose to come to the front office to pay in cash or cheque. Cheques may be made payable to VAM. If you would like a payment plan using post-dated cheques, please contact [email protected] for details. Regular office hours are Monday-Friday, 9:00am-6:00pm; Saturday 9:00am-2:00pm. If you are unable to come to the office during this time, please contact the office at [email protected] or 604.734.2301 for details on submitting cheques outside of office hours. Once your payment is received, the registration process is complete.